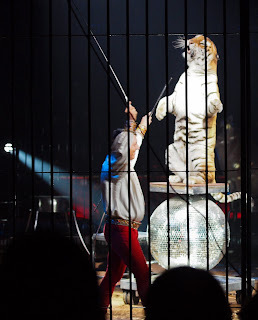 Tiger, tiger... the beautiful tigers of Flavio Togni's Amercan Circus. The first photo was taken one morning and the second at the show on Wednesday night. I always have mixed feelings seeing wild animals perform tricks although I understand that via zoos and circuses many more of these wonderful animals are alive. 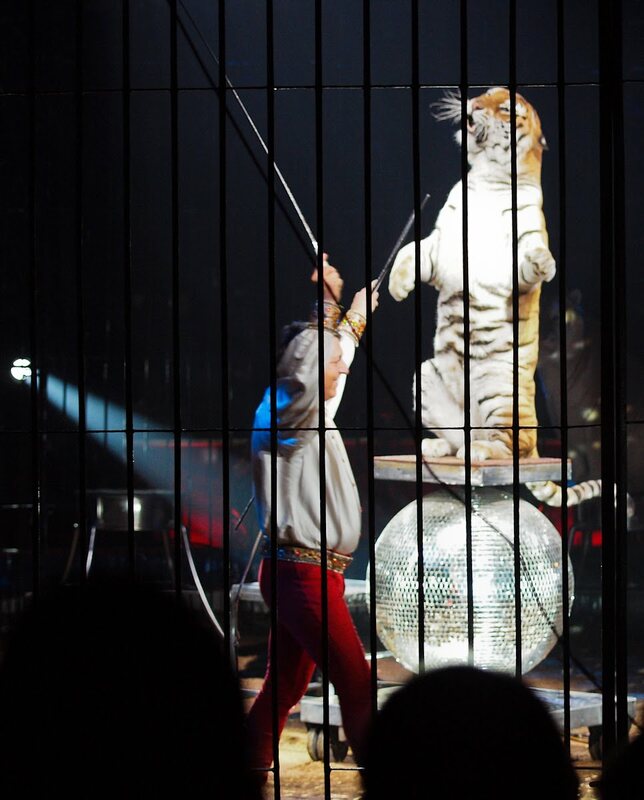 These tigers are in wonderful condition, play like kittens and seem to enjoy performing. Flavio Togni is one of the world's leading animals trainers - he owns the elephants, the camels and the horses at this show - and he was one of only two acts this year to receive the most prestigious prize, the Golden Clown, presented by Prince Albert. (The other winner was my favourite act and we'll meet him another day). It is hard for me to comment, for I am for animal rights --- as you say here the animals are well taken care of in captivity. 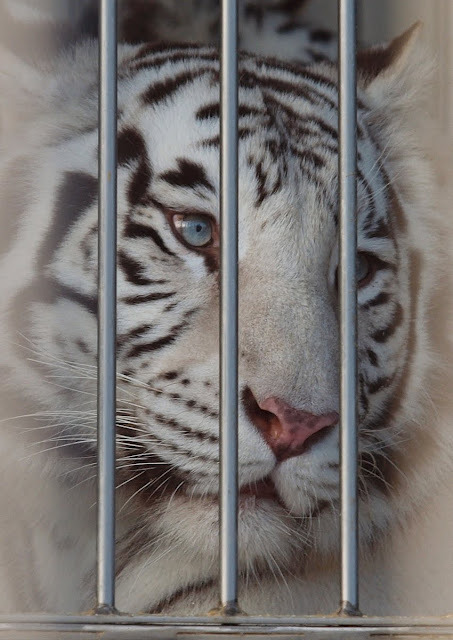 The first photo of this tiger is superb, the bars disturb me but it is better then becoming someones fur coat or rug. Oh that top photo is marvelous Jilly. Really really beautiful. Well shot my friend. Really a beautiful animal and a remarkable photo. I, too, wish he was in a protected wild area. Kate, yes in a protected wild area - of course, but often in the wild an animal like this becomes someone's fur coat. I suppose too, many circus animals are bred in captivity. I can hear the music, applause, and excitement. These photos are superb. Look at the point on the toes of the balancer! I wont get into the wider argument, Jilly. I just wanted to comment upon that first photograph. It is just terrific. The eyes and the wistful look. Wonderful capture.